Herra Björnsson is at the beginning of the end of her life. Oh, she has two weeks left, maybe three—she has booked her cremation appointment, at a crispy 1,000 degrees, so it won’t be long. But until then she has her cigarettes, a World War II–era weapon, some Facebook friends, and her memories to sustain her. And what a life this remarkable eighty-year-old narrator has led. 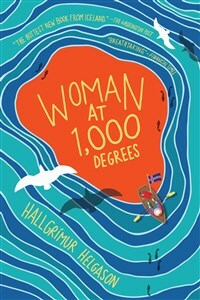 In the internationally bestselling and award-winning Woman at 1,000 Degrees, which has been published in fourteen languages, noted Icelandic novelist Hallgrímur Helgason has created a true literary original. From Herra’s childhood in the remote islands of Iceland, where she was born the granddaughter of Iceland’s first president, to teen years spent living by her wits alone in war-torn Europe while her father fought on the side of the Nazis, to love affairs on several continents, Herra Björnsson moved Zelig-like through the major events and locales of the twentieth century. She wed and lost husbands, had children, fled a war, kissed a Beatle, weathered the Icelandic financial crash, and mastered the Internet. She has experienced luck and betrayal and upheaval and pain, and—with a bawdy, uncompromising spirit—she has survived it all. Now, as she awaits death in a garage in Reykjavík, she shows us a woman unbowed by the forces of history. Each part of Herra’s story is a poignant piece of a puzzle that comes together in the final pages of this remarkable, unpredictable, and enthralling novel. Hallgrímur Helgason was born in Reykjavík, Iceland, in 1959. He started out as an artist and debuted as a novelist in 1990, gaining international attention with his third novel, 101 Reykjavík, which was translated into fourteen languages and made into a film. He has thrice been nominated for the Nordic Council Literature Prize, including for his novel Woman at 1,000 Degrees. Also a columnist and a father of three, he now divides his time between Reykjavík and Hrísey Island. His website is HallgrimurHelgason.com.